« T.O. Already An Unhappy Camper In Buffalo? Browns Continue Awful Start – Where Do They Go From Here? 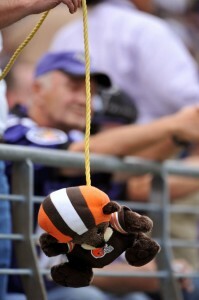 The quarterback situation in Cleveland took a decidedly horrendous turn Sunday in the loss to Baltimore. Brady Quinn played his way out of the lineup and Derek Anderson did so poorly that Quinn by default will still probably start Game 4. There are no real positives here. Every defense made for Quinn just doesn’t hold up. I wrote last week that starting Quinn against Baltimore was the right thing because he needed the reps. I stand by that. In all honesty, I never expected him to beat Baltimore; I just expected a better showing. Something that proved he was beginning to “get it.” Unfortunately, the only thing I saw was an overmatched quarterback who seemed ill equipped to succeed at the NFL level. Things don’t get any easier when you look around the league and see numerous young quarterbacks making their mark. Joe Flacco looks like a possible MVP candidate. Matt Ryan, despite his team’s loss to the Patriots is a bright star on the rise. Let’s not forget to mention Mark Sanchez. Crown him “King of New York.” So, how did we get it so wrong when we brought in the kid from Notre Dame, gave him three years to prepare, and are now treated to such horrible results. Nobody on this team should be better prepared than Brady Quinn. He has worked and dreamed about this moment since he signed his contract. He wasn’t thrown to the wolves. His only saving grace is the coaching carousel that has defined the Browns experience since they returned. But, I don’t buy that Mangini’s schemes through Daboll are that different from anything Quinn had to digest from Weis or Crennel. They are all from the same coaching family, let’s be honest. This transition should be seamless. So, what next? Where does this team go from here? I argue that we have to sink or swim with Quinn. He has the work ethic and leadership skills to turn this around. We must find out if the light comes on or not. It just seems like time is running out for him. The leash seemed pretty short yesterday regardless of his struggles. I can’t help but wonder if Kokinis, after yesterday’s debacle, isn’t busy looking for a possible Quinn replacement on another team’s roster. At 0-3, pretending we aren’t rebuilding is a farce, might as well go all the way with it. Make no mistake about it though. No matter what happens the rest of the season, Mangini will be drafting a quarterback next year. He will bring in “his guy” to build this franchise around. He has no choice now. This current Browns team is at the bottom of the division and wins will be scarce. Quinn and Anderson, two of the three high profile players left from the Crennel/Savage era, may discover that their time is now up in Cleveland.